This is especially useful considering that most owls are nocturnal and hunt in the dusk and dawn hours, when they can be located by sight but the darkened conditions make it hard to see specific body traits. In these lighting conditions, it is often possible to determine approximately which species it is by being able to eliminate other species because they are obviously the wrong size. For example, Northern Saw-whet Owls are quite active at dusk and can surprise you by suddenly darting out from cover and flying across an open area to some other, dense cover. 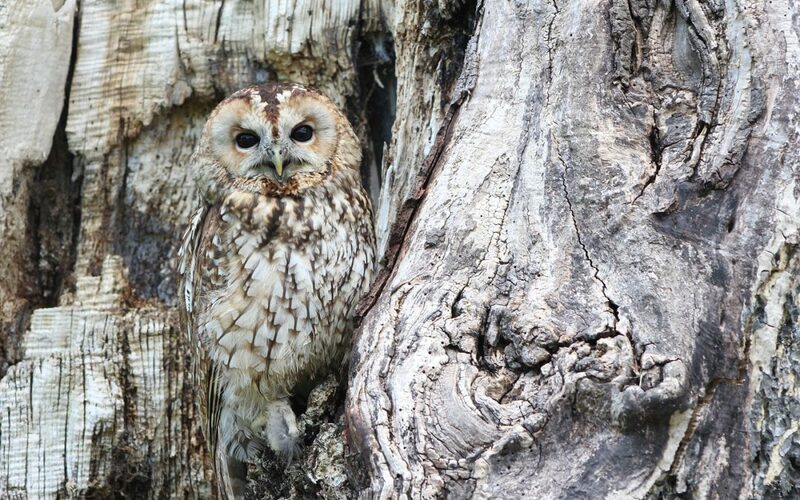 In that quick look at the bird, which is only about 7-8.5 inches in size, you can rule out every owl species from Barn Owl and larger, because the Barn Owl is about twice the size as a Saw-whet Owl. This will immediately eliminate 8 of the 20 owl species in North America. Some of the remaining owls have ranges restricted to specific areas of the continent, which is another trait which will help you eliminate possible species. The table below shows the body sizes of all 20 owl species in North America, from the largest to the smallest. One interesting feature of note in this table is that the largest owl is 5-6 times the size of the smallest owl, which is a huge size range for a group of closely related bird species.